Mobile Work Platforms | EGA Products, Inc. Mobile Work Platforms from EGA Products provide a secure workspace at a variety of heights. They add convenience and efficiency with the ability to roll wherever you need them to. You can even gain more access and get deeper into your inventory with our double entry and dual access work platforms that make it easier to navigate down narrow aisles or congested spaces. 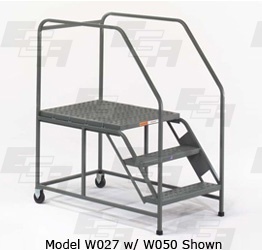 An EGA Products mobile ladder platform is an essential part of whatever industrial space it occupies. From the ease of use to the structural durability, EGA’s all-American material handling products are noted for being un-noted by the maintenance department. All EGA mobile work platforms meet or exceed OSHA standards. Mobility and access in rolling ladders are essential functionalities, and when work needs be done from an elevated position, a mobile work platform assures maximum flexibility to perform such work – where the work needs to be done. Getting a platform into position is important for work efficiencies, but there’s more than that. Industrial access and material handling equipment comes in many varieties, but not all of them are built right here in the United States. EGA Products have always been proudly made in the USA. When just about every manufacturer leaves for cheaper wages (cheaper quality too) and higher margins, EGA has maintained a commitment to producing the best mobile access work platforms in the world. Lightweight in the best way possible, the space-age aluminum used by EGA Products packs a punch. It’s a stable, solid work surface that will hold its own to weather and corrosion. This wall mounted ladder also holds its own in the toughest work environments too. 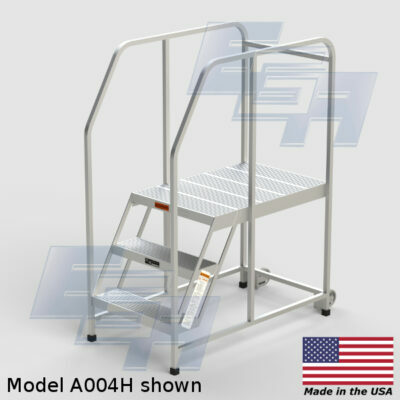 Coming to you fully assembled, the wall-mounted aluminum ladder only requires basic mounting. Being aluminum, the lightweight aspect comes in handy at this phase in the acquisition. Choose an Aluminum Work Platform if you’re in need extra weather and corrosion resistance. All-welded American Steel construction is a cornerstone of EGA Products. The platforms built right here in the US by EGA are anything but a commodity good. When business booms, these rolling work platforms move with the business. In many cases, employees that start after the purchase of an EGA work platform will retire before the industrial access equipment (with proper maintenance). Contact us if you need more information or if you need something custom designed and custom fabricated.